For many Americans who dream of traveling to Italy, images come to mind of Napoli style pizza, or large platters of pasta slathered in red tomato sauce. This is very common in the cuisine in the south of Italy, areas that include Sicily, Puglia, and of course, Naples. But, the food of the north is entirely unique. The Emilia Romagna region includes the cities of Bologna, Parma, and Modena. It is host to an entirely different style of Italian cuisine. The question is: what to eat in Emilia Romagna? Because there are some truly unique dishes to try! Here we offer suggestions on how to find the best Emilia Romagna food. Some of the more common pasta dishes you will eat in Emilia Romagna include tortellini, tagliatelle, and gnocchi. But, there is a pasta called passatelli, which is particular to Emilia Romagna. It’s virtually unheard of outside of Italy. A traditional pasta that is thicker than many others, it tastes a lot more dense. Passatelli is made with Parmigiano Reggiano, bread crumbs, egg, flour, and sometimes nutmeg. It’s most common to find passatelli served in a broth, which is the traditional preparation. However, passatelli is also served “dry,” without a broth, often mixed with fresh vegetables or meats. It is getting increasingly more difficult to find on menus in Emilia Romagna because it is so expensive to make. All of that Parmigiano Reggiano adds up. If you only eat one pasta in Emilia Romagna (although why would you want to do that?) passatelli is the one to try! Learn how to cook pasta at home! One of the most popular ways to eat cured meat is with gnocco fritto, a deep fried puff of bread popular around Modena. It is similar to torta fritta, which is popular around Parma. The bread is sliced open in order to pop a slice of mortadella inside. The meat normally melts into the warm bread. Another bread that is found around Modena is tigelle, a dense round bread almost like the cousin of an English muffin. Tigelle can be filled with anything, and can even be found serving the role of a sandwich bread for lunch. But the typical way to eat tigelle is with a plate of cured meats, perhaps with a selection of cheeses and pickled vegetables. Further to the east, traveling into Romagna, piadina becomes the bread of choice. Piadina is distinctly Romagnolo, and has been referred to as the bread of the people of Romagna. It is a lot larger and often cut into four wedges, rather than served whole like tigelle. Piadina is thinner, and there is no flower design pressed into the bread. Piadina is more crumbly, particularly after it cools. It’s best to eat a piadina no more than three minutes after it cooks, which can be a challenge. Each of these breads is unique, and serves as a must eat in Emilia Romagna. These are breads you just won’t find elsewhere in Italy. You can learn how to make some of the typical meat breads of Emilia Romagna with Helena at Yummy Italy! It’s easy to spend a 2 week holiday in Emilia Romagna gorging on pasta and platters of cured meats and cheeses. But, for a little adventure in your dining, Emilia Romagna has that too! Two of the meats in Emilia Romagna that are probably least known to travelers are cotechino and zampone. Cotechino is a fresh sausage, meaning it is not cured or aged. Traditionally, it was a way to serve the less tender cuts of meat. The meat is ground, placed inside a casing, boiled, and cooked in a dry oven. Afterwards, it is vacuum packed, making it one of the few meats in Emilia Romagna to be found in a box. Zampone is similar to cotechino in that it is a fresh sausage, ground with salt, seasonings, and pork rinds. The difference is that the sausage is stuffed inside a pork trotter, or the foot and front leg of the pig. Because it takes so long to cook zampone, it is often pre-cooked and also sold vacuum packed, sometimes also in a box. During the winter months, it’s common to find both cotechino and zampone served with lentils or white beans, along with mashed potatoes. They are both hearty dishes, often reserved for Christmas or New Year. It’s not common to see them on restaurant menus in and around Modena. Although it’s possible. This is what makes traveling in Emilia Romagna so exciting. Sure, it’s Italy. But the food is so different than what you get in other parts of the country! There is more to learn about what to eat in Emilia Romagna. I’ve covered a lot of it in our blog over the last few years, but I took it up a notch and wrote a book about what to eat in Emilia Romagna! The above “unique foods” are discussed in the book, as well as a lot more! 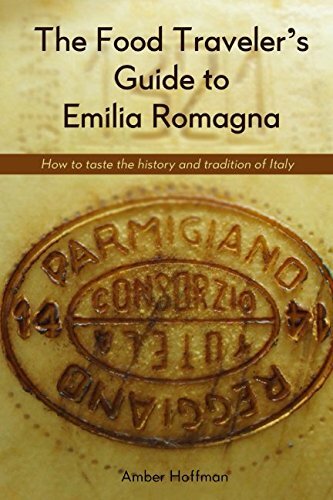 The Food Traveler’s Guide to Emilia Romagna: How to taste the history and tradition of Italyis available for Kindle on Amazon ($9.99), as well as in paperback on Amazon ($12.99). It is available on Amazon in the US, as well as throughout Europe, and even in Japan and Brazil! If you are a NOOK reader, it is also available for download on Barnes and Noble. Learn more in our Emilia Romagna Food Travel Guide, which provides travel advice on the best Emilia Romagna cities and best Emilia Romagna destinations for food travelers. Meat bread is so yummy and I would like to give it a try. Do you have this recipe? Unfortunately, I don’t have any of the recipes any more. Sorry.